Compact, near-silent, and versatile, the 4-bay M.2 SSD NASbook TBS-453A is ideal for office meetings and multimedia applications. 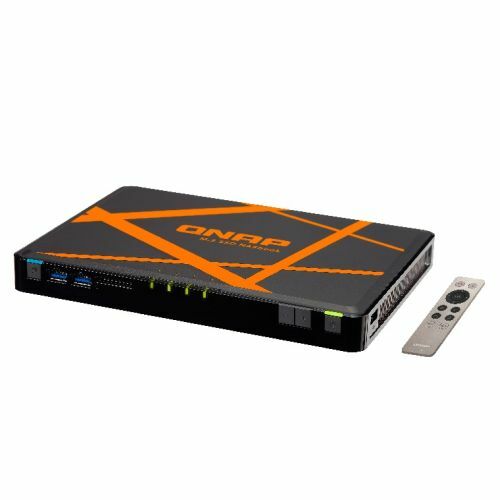 Featuring a quad-core Intel® 1.6GHz processor, a built-in 4-port network switch, and using up to 4 M.2 SSDs for storage, the TBS-453A not only provides full-fledged NAS functions with RAID protection, but also can act as a switch and share network access with multiple users regardless of being powered on or off. Coupled with its dual HDMI output and 4K H.264 video display & transcoding abilities, the TBS-453A can easily be carried to meetings to present stored files and quality multimedia content. The TBS-453A also supports the open-source Linux® platform that allows you to directly utilize feature-rich Linux® apps, enjoying a private cloud combining storage and IoT applications.